Who doesn't love a great bounce house rental? But what do you do if it's just too hot to jump insides one of our great bouncer rentals? Add Water! 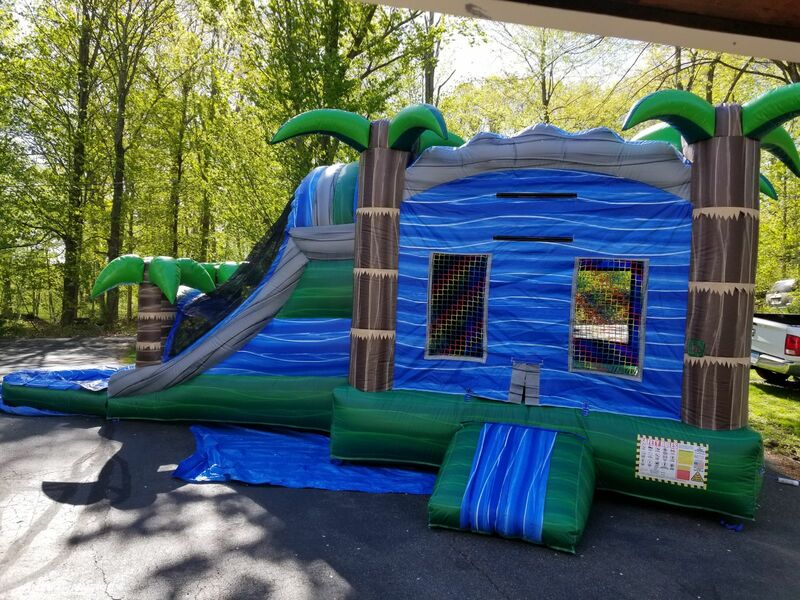 Check out an awesome wet combo bouncer from Bounce Blast LLC in Naugatuck, CT. A combo bouncer rental has all the fun of a bounce house with a large jump area with plenty of room for kids to jump and play. It also includes a climbing wall that will challenge the kids and make them work to get to the top for a thrilling ride down an inflatable slide right into a splash pool. The pool is soft and shallow, making it safe and fun for all ages, even the smallest of all jumpers. We always advise that a parent supervise. Check out our Tiki Combo Wet! This fun and slippery combo bouncer will turn your backyard into a tropical oasis. Click here to get this inflatable party rental today. Thank you for choosing Bounce Blast LLC for all your party and event entertainment needs! If you have a specific date in mind; it important to call and book your wet combo bouncer in advance to ensure your inflatable rental is available. Click here to contact us!